According to unconfirmed rumors, Promos has shut down all its image sensor activities. Promos decided to enter image sensors more than 2 years ago. Promos and Cypress formed JV to adapt Cypress image sensor process. The JV has successfully designed 3.6um pixels on 12" wafers but later decided to concentrate on smaller pixels for mobile phones. Then Promos decided to transfer the 12" fab dealing with image sensor project from Taiwan to Chengdu, China. But with the recent economic turmoil the whole image sensor project has been canceled. After the successful demonstration of Advasense engineering samples, the company was contacted by a potential strategic partner with a request to check cooperation possibility. Apparently, the company is checking this option. Update: I got few emails saying that the second paragraph is not written clearly. It was supposed to talk about Advasense only, with no connection with Promos. Basically, it says that Advasense is checking the cooperation possibilities with a potential strategic partner. Yahoo: For the three months ending Jan. 31, Omnivision reported a loss of $18.2M, compared with a profit of $22.5M a year ago. Revenue was $80M compared with $224.9M in the year-ago period. Gross margin for the last quarter was 22.4% as compared to 25.0% for the previous quarter and 27.1% for the year ago one. The company expects next quarter revenues will be in the range of $60M to $70M and net loss will be between $22.2M and $26.8M. Shaw Hong, OmniVision's CEO, said in a statement that the company is making targeted expense reductions that should let it grow in the long term. ... do you see any kind of share loss or share gain in any particular resolutions or geographies? ... primary measurements for calendar 2008 would show we believe that we have retained our market share overall. Okay. So, everything is just a reflection of the end market. It is not any share loss or anything like that? Yes. We would agree with that. ... Can you talk a little bit about maybe the pricing pressures that you buy in market whether it is about pixel, megapixel VGA and other ratios still are holding up where if you could give us what those ratios are out in the past you have given them out. ... The ratio is still remain the same roughly VGA and then 1 megapixel about 2X and 2 megapixels about two to three X and now 3 megapixel closer to 3X. The issue with the pricing pressure is really a reflection of the economy, and so as you may have noted in our average ASP coming down to $1.43. During the quarter, we have multiple design wins for both our 1.4 micron and 1.7 micron BSI products. These wins included Tier-1 customers in multiple applications, multiple geographic regions and across all sense of resolutions. We are very enthusiastic about the reception we have seen for BSI and have received in-customer validation on our leadership and image quality. We believe that revenues from these BSI wins will begin to ramp in the first quarter of fiscal 2010. As for our CameraCube products, we have locked down several design wins in Tier-1 OEM customers over several regions. CameraCube products will begin to contribute to revenue starting in April 2009 and ramp significantly thereafter. Techshow Wire:Scalado and Kodak announced that Scalado’s SpeedTags technology will be implemented in Kodak’s upcoming KSP-720060 TRUESENSE enabled ISP and follow-on stand-alone ISP companion chips. PR.com: Dblur announced that 3.2MP 1/4” EDoF camera module integrating its technology has entered mass production by Sunny Group, China. Sunny has been mass producing it since January 2009 and is incorporating the Dblur enabled camera module in numerous mobile phones. Thanks to G.M. for letting me know. 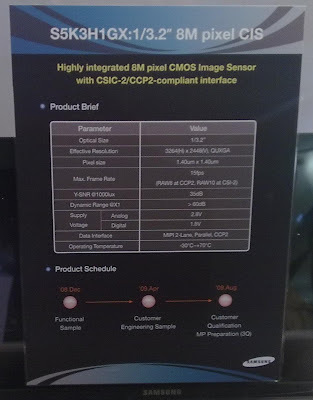 Chipworks put some early pictures of Sony BSI sensor on a special page. Chipworks says: "We are excited to see this part, we've only just begun our cross sectional analysis and already we are seeing many clever tricks used by Sony." Thanks to R.F. for the information. PR.com: Dblur’s Software Lens technology is approved and supported by MediaTek baseband chips, after months of rigorous testing. In addition, MediaTek has approved Dblur’s stand-alone chip, PD3615SA available from Pantek. Dblur’s EDoF technology approval by MediaTek is a significant milestone for the company. ST introduced the 1/4" optical format, 3MP raw Bayer sensors with integrated EDoF. The VD6853 and VD6803 sensors are said to enable camera modules as small as 6.5 x 6.5mm. EDoF extends the sensor's depth of field from 15cm to infinity. The sensors are available in ST’s TSV wafer-level package. This type of package enables the production of standard as well as wafer-level camera modules. The 1.75um pixel-based VD6853 and VD6803 sensors differ in their interface: 10-bit parallel legacy interface in VD6803 and CCP2 interface in VD6853. Both provide 20fps speed at full resolution and use ST's 90nm CMOS process. Engineering samples and demo-kits are available now, with the volume production scheduled for Q3 2009. Unit pricing is below $5, depending on the package types and shipment dates. Thanks to R.F. for sending me the info. Herzliya, (Israel), February 16th, 2009 – Dblur, the developer of Software Lens™ technology, today announced the introduction of a Dblur enabled camera phone from Bird, the leading mobile phone manufacturer in China. The H716 and H718 camera phone models, incorporating Dblur EDoF technology, are currently in mass production. Dblur’s EDoF technology enhances and extends the camera's in-focus range from Macro (15cm and above) images and up-close business card and bar-code scanning to best quality landscape. By implementing this technology Bird is able to provide its customers increased value by offering cost effective ‘all-in-focus’ cameras without focusing delays and missed focus images. “The end user experience of the mobile phone camera is significantly improved,” says Wu, Guofeng, Deputy General Manager of Ningbo Bird Software Co., Ltd., “Dblur’s EDoF technology allows virtually everything to be in focus at the same time which eliminates the ‘focus on the wrong object’ images which results in a poor user experience,” he adds. Dblur’s EDoF technology also eliminates auto-focus related delays, such as focusing delays, which jeopardized the opportunity to “capture the moment”. Users will now be able to confidently “point and shoot” without worrying about focus. “Bird’s Dblur enabled mobile phone, which Incorporates MTK’s baseband, truly elevates the user experience,” says Guy N. Michrowski, VP Sales and Marketing at Dblur Technologies. “The mass production of an EDoF camera offering from Bird, China’s leading mobile phone vendor, is a significant milestone for Dblur and is the result of many months of extensive development and testing that involved several parties,” he adds. The Dblur enabled H716 and H718 mobile phone models are available now from Bird. Update: PR.com has published Dblur's press release. Microsoft Getting Into Image Sensors? Haaretz and Reuters report that Microsoft is negotiating to acquire the Israeli startup 3DV Systems for about $35M. 3DV Systems develops 3D imaging technology for digital cameras that it sells, called ZCams (formerly Z-Sense). Microsoft apparently plans to use 3DV Systems' technology in its own gaming technology, probably in the Xbox 360. If these reports are true, we would finally have one image sensor maker that is not losing money in these times. Yahoo: Aptina announced the launch of 1.4um pixel-based 8MP image sensor, the MT9E013. Aptina's new sensor provides key features for mobile phones such as HD video output, 2x2 pixel binning with re-sampling for improved video image quality, multiple interfaces including parallel, MIPI (2-lane) and CCP2, and an on-chip Voice Coil Motor (VCM) driver. MT9E013 samples are presently available with mass production scheduled for the end of July 2009. Digitimes reports that the mainstream of phone cameras will shift from 2MP currently to 3MP in 2009, according to Scott Lin, chairman of Largan. The mainstream resolution may further rise to 8-megapixel in 2010, Lin pointed out. In addition to resolution, demand for automatic focus (AF) is on the rise. Yahoo: At the annual Mobile World Congress (MWC) OmniVision unveiled its latest low-voltage 1/4" 3MP sensor. Featuring OmniVision's 1.75um OmniPixel3-HS FSI pixel, the OV3650 delivers 960mV/lux-sec sensitivity. The OV3650 operates at up to 15fps at full resolution and provides all required image processing functions, including exposure control, white balance, and defective pixel canceling, all are programmable through the SCCB interface. For customized information purposes, the OV3650 includes a OTP memory. The OV3650 has a one lane MIPI interface and a traditional parallel digital video port. The OV3650 is immediately available for customer sampling. Volume production is expected in the second calendar quarter of 2009. Yahoo: Also at MWC in Barcelona, Omnivision demos its OmniBSI Development Platform (OV8810 8MP BSI sensor coupled with Fujitsu Milbeaut M5mo ISP), CameraCube Technology (OVM6680 & OVM7690 sensors), the OV3642 3MP 1.75um pixel SOC with embedded EDoF ISP. Sanyo application US20090032854 adds CCD-like electron multiplier to a CMOS pixel. Incidentally, Sanyo also presented a paper on this pixel at ISSCC last week. The idea is very nice and allows to minimize the pixel noise at low illumination level. However, the higher voltage and large pixel size limits it to the applications where cost is not the primary consideration. IBM application US20090035886 proposes to use pre-doped poly for transfer gate to avoid possibility of wrong doping type in its parts after all the complex doping procedures of 4T pixel. Looks like quite weak patent application to me. Samsung application US20090032852 presenta yet another variation of the idea of expanding floating diffusion dynamic range by making it low capacitance for small signals and higher capacitance for large signals. The imager has two basic tiers, which consists of seven layers. The first two tiers are the 3-D imager. Tier 1 has 100% fill factor, deep-depletion photodiodes, thinned to 50um. Tier 2 consists of SOI-CMOS pixel readout and selection circuitry that is 3-D connected to Tier 1 photodiodes. The remaining five layers have a multi-chip silicon stack, which includes two silicon chips with 64 12b pipelined analog-to-digital converters, a timing sequencer, tile address encoder, bias generators, I2C serial interface, and two 12b wide LVDS outputs running at 512-Mb/s. The imager is connected to the stack via a gold stud bump array at a 500um pitch. 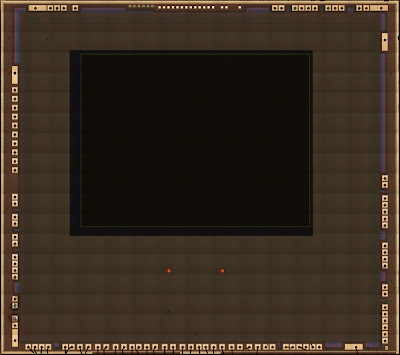 The imagers can be tiled together to create larger arrays. Chipworks blog shows its recent finding about the first Canon CMOS sensor used in compact cameras. The 1.7um pixel 11.8MP sensor was extracted from PowerShot SX1 IS camera. The LC1090 sensor is the first time Chipworks have seen Canon use a copper back end process in an imager. Canon used no light pipes, just added process steps to clear the line sealants from the optical path. Comparing to previously analyzed Canon image sensors, Chipworks calls LC1090 revolutionary for Canon. The signal routing metal has been fully optimized for optical symmetry, and borderless contacts are used as part of a space saving layout. Another news is using SiLK dielectric in the BEOL. It's the first implementation of a true low-k dielectric in the BEOL of an image sensor, based on Chipworks' analyses. The low-k resin is likely first generation SiLK D or SiLK J, as opposed to Dow's next generation porous SiLK. First generation SiLK has a reported k-value of 2.6. A hybrid fabrication process is used for the Canon LC1090. The front end is typical of Canon 0.25 µm generation processing, while BEOL is 0.13 µm process. There is no end to organizations certifying image sensors. Digitimes reports that Global Mobility Bazzar (GMB), an alliance of white-box netbook makers, led by VIA Technologies, has granted certification to Pixart image sensors. The organization tries to ensure the compatibility of image sensors in different white-box netbooks. Pixart expects to begin small shipments of its VGA sensors to China's white-box netbook market in the second half of this year. Advanced Imaging Pro Magazine published DALSA article on how to choose sensors for machine vision applications. Most of the article discusses dynamic range, speed and responsivity trade-offs. I'm not sure what happens with RST signal routing in this scheme, it looks like the wiring should be duplicated. It might be not an issue, if SEL transistor is eliminated. 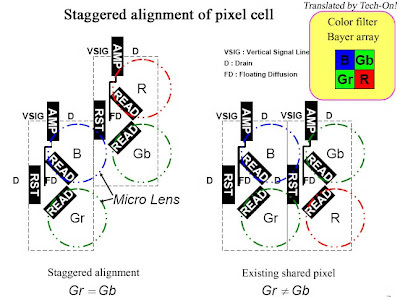 The staggered pixel is claimed to improve Gr/Gb ratio from 94.9% to 99.7%. Another innovation is the FD voltage boost, apparently achieved through the source follower gate capacitance. This is a nice idea, albeit a bit obvious. Toshiba plans to commercialize a product that uses staggered pixel layout and FD boost in spring 2009 at earliest. Richard Crisp published his paper about Residual Bulk Image (RBI) in CCDs on his web site. The paper was presented at recent IS&T/SPIE's Electronic Imaging Symposium, San Jose Ca. January 21, 2009. One needs to click on picture to download the pdf file. While I don't entirely agree with Richard's explanations, the RBI phenomenon itself is quite interesting and the paper is certainly worth reading. By the way, Richard's site has a lot of other imaging-related information. ... my intent behind the paper was to really focus on the characterization and management of RBI, not so much to explain the phenomenon. That has been done many times by others. Janesick discusses it in detail in his book on Scientific CCDs. I only wanted to lightly touch on the root cause and then discuss how to quantify it and to assess the impact of its management on noise of ccds. Digitimes reports that camera module shipments increased since the beginning of February 2009, mainly because of large orders from leading vendors of netbooks or mini-notebooks, especially Acer, Sony and HP. Most of these modules have VGA resolution. Yahoo: OmniVision's new CameraCube technology is a three-dimensional reflowable camera solution that combines the full functionality of a single-chip image sensor, embedded image processor, and wafer-level optics in one compact, small-footprint package. OmniVision's has enabled the industry's smallest profile and z-height (down to 2.5 X 2.9 X 2.5 mm) for today's ultra-slim mobile phones and emerging markets including notebook PC, surveillance, automotive and medical cameras. The new CameraCube devices, which include the OVM6680 (400 x 400 SGA) and OVM7690 (VGA), are immediately available in volume production. Additional devices based on the new technology are slated for release throughout 2009. Yahoo: Advasense is working with Creative Sensor Inc., (CSI) to create the world’s smallest 5MP AF Camera Module for the mobile phone mass market. Advasense’s ASIO5 – a 5MP, 1/4" optical format, 1.4u FCP CMOS Image Sensor is incorporated into the CSI AF camera module, measuring just 8.3mm x 8.3mm. Advasense will be demonstrating the ASIO5 imager at Mobile World Congress 2009 in Barcelona, 16-18 February. As Hynix CEO Jong-Kap Kim says in his message to the shareholders, Hynix keeps seeing image sensors is its future growth platform and plans to strengthen its competitiveness in CMOS sensors. EETimes article talks about a smart sensor for machine vision created by Swiss Center for Electronics (CSEM). The in-pixel logarithmic compression is complemented by a state machine which enables simple arithmetic operations among neighboring pixels to calculate contrast and the direction of image features (orientation). Then integrated DSP continues processing. Wafer-level cameras require novel strategies for optical design and stray light management. Very few optical designers have WLC experience. Integration of actuators for autofocus, mechanical zoom or shutters is difficult or impossible. The lens material must be suitable for high-throughput imprint lithography, UV-curable, reflowable at 260°C, and must have long-term stability in harsh environments. Hybrid wafers from polymer lens material and glass substrates show issues during wafer-level integration (warping, bowing) due to thermal expansion mismatch. Glass-only solutions may have a competitive advantage. For chromatic correction, different lens materials (crown and flint glass types) must be available. Additonal material problems are introduced with antireflective coatings on polymers, apertures or baffle layers and IR cut filter. Optical testing of aspherical and free-form microlenses is extremely difficult. Wafer-level, high-throughput lens testing is mandatory to maintain high production yields. Opto-wafers are usually not perfectly planar. Bow, warp and double-sided optics make it especially difficult to mount a stack of 3–6 different wafers. Gluing and sealing for the wafer stack is not trivial in terms of reflow temperature restrictions. Dicing of the complete WLC stack consisting of different materials is complicated and significantly impacts yield. WLC technology and through-silicon via (TSV) technology is protected by numerous patents. The profit margins for mobile phone camera suppliers are already small. WLC manufacturers might simply not earn enough to finance the new technology ramp-up and to pay the license fees. Thanks to R.C. for pointing me to this. EETimes: Allvia (Sunnyvale, Calif.) which presents itself as the world's first TSV foundry, has secured $5M from private investors. It claims to have been producing TSVs for over five years, providing development work for MEMS, sensors and other customers. Allvia is developing TSVs with diameters of 10um and up. Its 20,000-square-feet facility operates since 2004 and represents an investment of more than $6M. "We're a specialty foundry," said Sergey Savastiouk, CEO of Allvia. "We are producing (TSVs) while others are talking." EETimes presents 3.5min video nicely describing SiOnyx "black silicon" technology. A wafer with pixel prototypes reveals what looks like 1/2" or 1/4"-sized pixels to my eyes. So far the company raised $13M and after a few years of work looks for more investments. EETimes: At CES last month, Hitachi Consumer Electronics Laboratory demonstrated a gesture-controlled TV based on Canesta's new consumer 3-D sensor. Canesta adapted its 3-D CMOS image technology from automotive applications to a new consumer version. Now, consumer electronics makers are using Canesta's reference design kit to build gesture-recognition capabilities into TVs, DVD players, digital video recorders and set-top boxes. Canesta hopes to ride a wave of gesture standardization by partnering with software companies that offer manufacturers turnkey gesture routines for their devices. Canesta has so far joined with GestureTek Inc. (Sunnyvale, Calif.), Softkinetic S.A. (Brussels, Belgium) and Edge 3 Technologies (Prescott, Ariz.). Yahoo: Kodak's announced a new strategy to cut costs. In image sensors, Kodak says it will seek alliances with other companies. Reuters also reports that Kodak plans to trim its own CMOS image sensor investment. The company hopes that some unnamed partner would help it to fund the further development. Kodak said it will pursue "alliances or other business model changes to reduce risk and enhance revenue and margins." "We are not thinking of divesting any of those businesses [image sensor and some others]," Antonio Perez added. "We have to find a way to continue to be in all those businesses without all the risk." "Image Sensor Solutions ... require additional investment in order to achieve their full potential. Kodak will reposition these businesses by pursuing alliances or other business model changes to reduce risk and enhance revenue and margins." Turning back to 2008, ... In the fourth quarter, we signed two new licensees for our image sensor wafer-level packaging technology, AWLP and Qtech. We also achieved smart optics and smart imaging design wins with existing and new customers. We expect the combination of these activities will lead to our technology being shipped in up to 100 million camera-enabled cell phones within the next 24 months. We cannot disclose some of these contracts publicly. ...one of our first SHELLCASE, MVP licensees, Nemotek should begin sampling customers this quarter. ... our product launched services operation is up and running. We received our first customer order for production and expect to be engaged with one or more customers for production of our optimal single element VGA Lens in the first half of 2009. ... on the technology front, in the first quarter we expect to display first images from our 3-megapixel version of our OptiML Wafer-Level Camera Technology and demonstrate a new smart imaging technology. 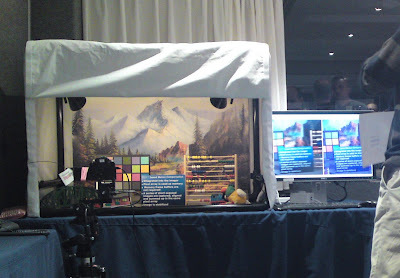 Advasense has updated the Feedback Controlled Pixel (FCP) technology page on its web site. Now it includes comparisons FCP with conventional 4T pixel. The company demos its sensor at 3GSM Congress in Barcelona, Spain, February 16-18, 2009. Thanks to A.G. for letting me know. Test & Measurement World: Kodak explains how to boost frame rate in progressive scan CCDs. No wonders, there are two ways to do it: reduce pixel size or multiply number of outputs.